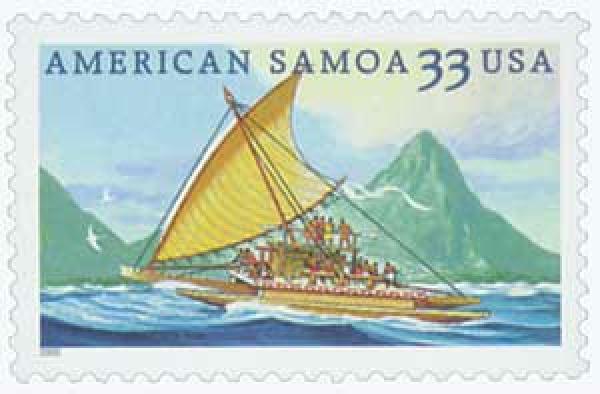 American Samoa Ceded to the U.S. 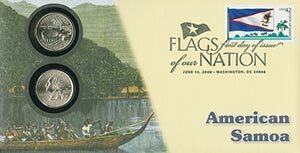 US #3389 was issued on this day in 2000 to celebrate 100 years of unity. On April 17, 1900, chiefs on the island of Tutuila signed the Treaty of Cession of Tutuila, transferring control of American Samoa to the United States. American Samoa’s earliest inhabitants arrived at the islands west of Samoa as early as 1500 BC. Samoa’s Manu’a Islands have one of the oldest recorded histories in Polynesia. US #3389 – Fleetwood Plate Block First Day Cover. Many years later, according to legend, Nafanua, a Samoan warrior goddess, was called upon during a battle between the Tongans and Samoans. When the Tongans realized it was a woman, they ended the war. Nafanua created the Samoan government, headquartered in Savaii. Many credit Nafanua and her descendant Queen Salamasina for creating the islands’ faamatai (local government) and the fa’asamoa (local customs). Nafanua also told the Samoans that sometime in the future, a new government from across the seas would come and that they should support it. US #3389 – Mystic First Day Cover. During the early 1830s, John Williams of the Congregationalist London Missionary Society became the first missionary to reach the Samoan Islands. Samoans likely saw his arrival as the fulfillment of Nafanua’s prophecy and adopted Christianity. Williams’ arrival was soon followed by many other missionaries and traders, making Pago Pago one of the largest whaling ports in the entire Pacific Ocean. Destined for China, many of the traders who passed through the islands were so fond of the scenery and climate that they settled there, bringing with them many diseases to which the native Samoans had no immunities. 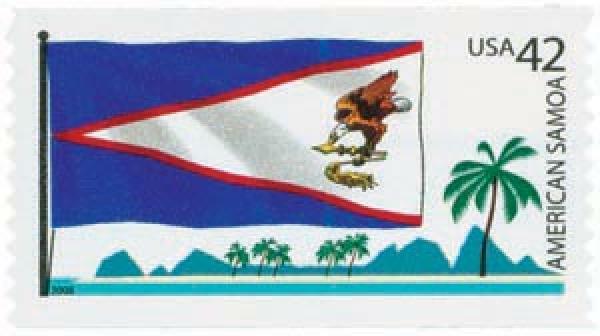 US #4276 – American Samoa’s flag pictures an eagle clutching a war club and a ritual stick representing the wisdom of the councils. 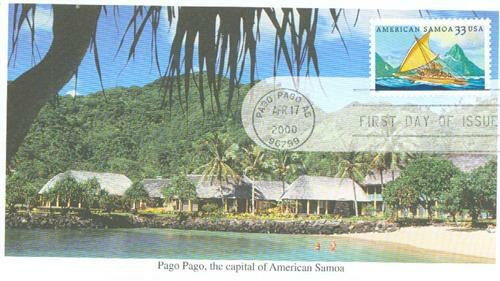 The Samoans’ first contact with Americans occurred in 1872 when US Navy Commander Richard Meade met with Tutuil’a Island’s Chief Manuma to establish a port in Pago Pago. Around this same time, traders from the United Kingdom and Germany also established trade posts on the islands. The Samoans, British, Germans, and Americans lived peacefully until 1889, when three German ships invaded a Samoan village, damaging American property. In response, three American ships entered the harbor, preparing to fire. However, before either side could shoot, a typhoon wrecked all six ships and an armistice was called. US #4276 – Fleetwood First Day Cover. Tensions continued between the nations, resulting in the 1899 Samoa Tripartite Convention. With representatives from each nation, the joint commission met to divide the islands. Germany received the western islands of Upolu, Savaii, Apolima, and Manono, while the US got control of Tutuila, Rose Island, and Aunu’u. Britain gave up its claims in exchange for Germany giving them their protectorates in the Northern Solomon Islands. On April 17, 1900, the local chiefs gave up their claims to the islands through the Treaty of Cession of Tutuila. The US officially took control of the eastern islands on June 7, 1900. The US Navy then expanded the Pago Pago Bay coaling station into a full naval station for the Pacific Squadron. The islands’ first presidents were US Navy officers operating the islands like a military base. 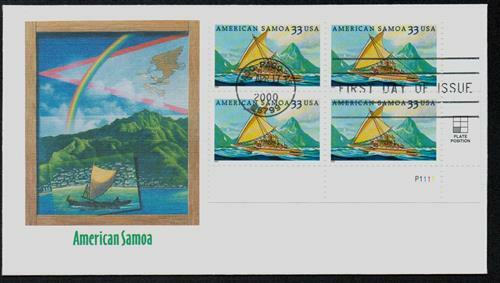 Item #CNC22 – American Samoa Coin First Day Cover. Under American control, Samoan customs remained prevalent. The chiefs were allowed to continue managing political affairs in their traditional form, through the faamatai. It was around this time that these islands began being referred to as American Samoa. By the time of World War II, American Samoa was an important military base and staging point for the Navy’s offensive strategies in the Pacific. During the war, Samoan men age 14 and older were trained in combat and also served as medical personnel, code personnel, and ship mechanics. When the war was over, the US Department of the Interior created Organic Act 4500 in an attempt to incorporate American Samoa. Samoan chiefs, led by Tuiasosopo Mariota, argued against it and the act was defeated in the US Congress. 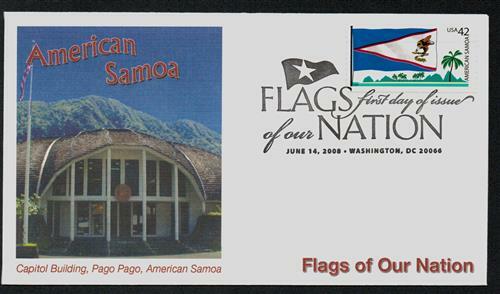 Item #SC04 – American Samoa coin panel. Up until 1951, the US Navy ran American Samoa. It was at this time that President Harry Truman officially turned over the responsibility of administering American Samoa to the Department of the Interior, drafting a new constitution in 1960. American Samoa officially became self-governing on July 1, 1967. In 1978, American Samoa was no longer led by a Navy-appointed governor, holding their first election. As a US territory, Samoa elects one non-voting delegate to the US House of Representatives and sends delegates to the Democratic and Republican National Conventions. People born in American Samoa are considered US nationals and cannot be a US citizen unless one of their parents is. One Response to "This Day in History… April 17, 1900"